Dual-class stock listings, often favoured by founders and families who take their companies public, have a bad rap with a number of stock markets, stock analysts and especially with institutional investors. These investment companies, including pension funds and other investment pools, claim dual-class systems are a threat to “democratic norms” in public markets because these ownership systems “entrench” families in control of their family companies. The business press has largely fallen in line with these critics, I think because they haven’t examined the benefits of dual-class systems and the weaknesses of today’s stock markets. Dual-class stock structures are beneficial for the economy because they allow families to stay in control of their companies while holding just a minority of the economic value of the family company. In a dual-class system, the class of shares held by the controlling family gives the family more votes per share (sometimes even all the votes), or special rights, in order to elect the board of directors they want. This allows these publicly traded family companies to pursue long-term objectives insulated somewhat from the extreme short-term pressures of the stock market. We should want all public companies to take actions that strengthen their long-term performance, like improving their operating efficiency and stimulating ongoing innovation, developing great managers and skilled employees, investing in promising new opportunities, and changing outmoded strategies and policies. These choices, however, usually require a long period to implement. Pressures that lead a company to avoid useful longer-term investments and changes so that short-term/quarterly results seem better, are wasteful and harmful to the economy and should be avoided. It is widely acknowledged that public companies feel pressured to take short-term actions to demonstrate that their quarterly earnings meet the expectations of analysts and key investors. Public companies are even known to manipulate their financial statements in response to quarterly pressures on earnings to achieve desired short-term results. Institutional investors are the most influential actors producing this short-term orientation. If a company narrowly misses its quarterly projections, institutional investors can and do move mountains of investment capital from one company to another. Anonymously-owned public companies are most vulnerable to these pressures. Have you observed that especially anonymously–owned public companies have been hoarding mountains of cash, not investing it, or using it to buy back their own shares? A key reason for this is that long-term bets by a company generally don’t produce quick short-term gains to a company’s stock price and could depress the stock price for a period. Publicly traded single class family-controlled companies do somewhat better at resisting short-term pressures because they naturally have a longer-term, sustainability orientation. 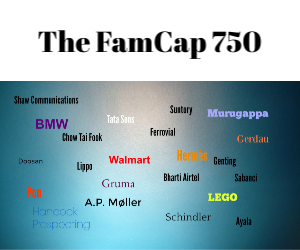 Family companies with dual-class ownership systems do the best of the lot. To understand the short-term bias in the stock market just follow the money. The stock market’s focus on short-term results agrees with the compensation incentives of many public company executives and institutional investor managers even if this bias perversely constrains the long-term performance of public companies. If you want to change the orientation of public companies and institutional investors, change how their key managers are compensated. This pressure by institutional investors on stock markets, in my opinion, constitutes a real threat to the health of capitalism because short-term pressures sway companies in the wrong direction. Marx warned us that economies and societies plant the seeds of their own destruction. Institutional investors — a natural outgrowth of large stockpiles of investment capital combined with investment managers with a mentality (encouraged by their compensation system) to maximize short-term economic gains are these seeds. Democratic norms in a public stock market do not mean that all owners have the same votes, as institutional investors have cleverly skewed the debate to argue. Public markets should be democratic in this way: public companies need to be responsible, clear about their strategies (long-term, short-term, etc. ), and transparent enough for investors to know how they are really performing against their stated strategies. Individual investors in the stock market come in all flavors—short-term and long-term oriented, some wanting liquidity, others appreciation. Public markets should make it easy for investors to know what they are buying. If stockholders don’t like what a public company is doing, they can vote with their feet. If public companies cheat stockholders, regulators should catch them and punish them. We need regulations and laws that promote good corporate behaviour. A good board will help a company perform better for all owners, given its stated strategy. Having an ownership control group in place helps to choose a board that can help a company be responsible and achieve long-term success. I think that public stock markets can serve a good purpose. We need to have a diverse ecology of mechanisms in an economy to capitalize companies (debt, private equity, public ownership, etc. ), including a public market option that serves all companies well and flexibly. Public markets have their obvious costs for companies, including transparency and compliance costs. The big problem comes from institutional investors. Because many institutional investors have relatively big positions in public companies, they can be very disruptive in the wrong way. The short-termism of institutional investors is what I really object to. Public markets need to wake up to the threat of powerful, short-term investors. Public ownership has already become less and less attractive to companies, and stock markets are shrinking. They will shrink more if they restrict dual-class shares. The stock markets shouldn’t let institutional investors be the seeds that undermine the value that stock markets can have.